Blyth Spartans progressed to the third qualifying round of the FA Trophy with a tight 1-0 win against Whitby Town on Saturday. Damen Mullen’s second half goal proved to be the difference in a flat and edgy game in which neither side really played well. But it was Blyth’s third win against Whitby from all three meetings this season, having already done the double over them in the Evo-Stik League. The hosts started the game in nervous fashion as the visitors opened with attacking intent high up the field. But Whitby were unable to capitalise on a miss-hit clearance from home keeper Fabian Otte. Then Joshua Neirney twice threatened to break the deadlock after he was unchallenged but ultimately he failed to trouble Otte. Spartans’ skipper Robbie Dale was at the heart of the best moves at the other end as he drilled the ball across the six-yard area but no Blyth player was able to connect with the ball before he produced a superb cross only for Daniel Maguire to head wide from six yards out. Then David McTierman fired over from inside the penalty area to cap off a half where Whitby were the better side yet not dominant. But it was roles reversed after the break. Matthew Wade and then Dale both had efforts as their side came out more threatening towards Shane Bland’s goal before the decisive moment of the match. Full back Mullen took control of the ball on the right side of Whitby’s third of the pitch and ran with it near to the six-yard area before slotting the ball past Bland to set off wild celebrations inside Croft Park. Mullen, clearly buoyed by the goal, got into a dangerous position again but was quickly closed down and could only tamely pass to Bland. Former Spartan Richard Pell had a headed effort just go over the bar following a set-piece for the visitors before Blyth substitute Sean Reid almost made an immediate impact with a well-hit effort just flashing past the post. Fellow substitute Liam Manderville wasted Whitby’s best chance of the game when he fired a shot towards goal from six yards and were it not for a crucial block it probably would have been 1-1. As the final whistle approached Blyth continued to press forward and Reid just could not connect with a loose ball from two yards, but in the end it didn’t matter. 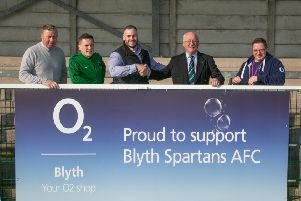 Blyth Spartans: F Otte, D Mullen, J Watson, D Morse, R Hutchinson, S Turnbull, A Nicholson (A Cartwright 80), M Richardson (S Reid 70), D Maguire, M Wade, R Dale. Subs not used: N Hooks, D Parker, P Robinson.